The venerable 20th century icon who brought us the Apple computer, iPod, and iPhone, Steve Jobs holds the fascination and imagination of people worldwide. The prices his autograph commands at auction attest to the keen interest still vibrantly alive for him. Unfortunately for admirers and autograph collectors, Jobs was a notoriously reluctant signer. Lucky enough to work at RR Auction as one of our handwriting experts since we’ve acquired a handful of the seldom-seen examples of Jobs autograph, I’ve been graced with their rare presence. I’d like to share here the extremely limited, valuable exemplars we’ve seen in order to educate fellow autograph enthusiasts. Over the course of 40 years, we’ve only encountered eight Jobs autographs, and all since 2012. Ranging from a simple signature on a business card sold in 2012 for $5,600, to a document sold the next year for $40,000, and most recently a 1973 job application for an astronomical $174,757 in March 2018, Jobs autographs are demanding an incredible premium in the marketplace. In studying these eight rare examples, here are my observations on the keys to identifying an authentic Steve Jobs autograph. When we think Jobs, many picture a strong leader, forging his way through Silicon Valley and would half expect a signature full of sharply drawn capitalized block letters. On par with his boundless imagination, the computer giant had a whimsical signature accomplished in an odd lowercase cursive fashion all his own. Was the fearless innovator more demure than people imagine? Jobs’s unexpected habit of not capitalizing his first and last name flies in the face of the characteristically abrasive stories we’ve all heard. Or maybe it was just his penchant to “think different,” that kept him from using capital letters in signatures as is the conventional norm. Though he didn’t sign often, Jobs’s autograph was fairly consistent over the period examples available to us, although the years shown varied widely from 1973 through 2008. Let’s start with the “S” in “Steve,” which is formed in a very unique lowercase cursive manner (as shown in Figures A through E above), often times not attached to the rest of his first name and usually below the dash in his following “t” (as shown in Figure A and B above). Jobs begins the “S” in a line straight up and comes down to make a loop at the bottom left (as shown in Figures A through E above). He does, however, fully connect the rest of his first name “teve,” which he sometimes lengthened to the more formal, “Steven,” especially on important documents (as shown below). The second letter, “t,” is most always swiftly dashed, often with a depleting line on the right or left side (as shown in Figure B and E above). As far as the Apple founder’s surname goes, the letter formation of his opening “J,” is again a very unique version of a lowercase cursive “j.” To start, it has a starkly straight upward line and a rounded lower loop below that goes on to connect to all the letters of his last name. Jobs uniquely strings together the letters in his surname with neat rounded loops at the top (as shown in Figures A through E). His ‘b” has a bubbly bottom portion and is most always wide open at the top, where it flows into the ending “s” in an very unique way, casually dangling his final letter from the end of the neatly formed “b,” and always on a much higher plane (as shown in Figures A through E). On two in-person autograph exemplars, in his rush and brevity, Jobs interestingly omits formation of the concluding “s” entirely (Figures B and E). Another unique aspect of Jobs’s autograph is the uneven flow of movement on the bottom of his letter formations. His first name seems to flow upward and his last name downwards. No straight lines and rules here, even when signing on the hard dotted line of a contract. He put his technical skills to work in 1974 when he secured a job as an Atari technician, heavily relying on the help of Steve Wozniak. In 1976, Jobs and Wozniak set out on their own to found Apple, introducing the personal computer to the world. An amazingly revealing document, we see here Jobs’s early aspiration to work in the fledgling tech industry, the very same which he would end up revolutionizing. Since 2013, RR Auction has presented collectors with two incredibly rare Steve Jobs signed documents, one of which was desirably dual-signed. In December 2013, RR Auction sold an eight-page Jobs-signed document for $40,000 (Figure A). Signed formally, “Steven Jobs,” the contact, a partnership agreement between Jobs and Robert Friedland for a place of business located at “Rt 2, Box 472, McMinnville, Oregon,” was dated August 17, 1978. Two years later, in January 2015, as a follow-up to this initial document hitting the market, RR offered a second Jobs eight-page document, this one dual-signed “Steven Jobs,” on the same day, August 17, 1978 (Figure B). Another partnership agreement between Jobs and Robert Friedland for a place of business located in Oregon, apparently an additional copy documenting the agreement. This rare, double-signed example sold for $25,000. Before becoming billionaire business tycoons, Steve Jobs and Robert Friedland were acid-dropping Reed College students with a mutual appreciation for Eastern spirituality. His first year at Reed, Jobs met the charismatic student body president and was instantly transfixed. When the future Apple founder dropped out of Reed, he spent much time with Friedland, traveling to India and on his communal farm and apple orchard near McMinnsville. The name “Apple” has been attributed to Jobs’s formative time working in the orchard. 1. In October 1988, Jobs came to Lotus Development Corporation in Cambridge MA to unveil the much anticipated NeXT computer. There he signed an issue of Newsweek for a senior Lotus buyer who worked at the manufacturing facility. The autograph obtainer recalled of the event, “The grand ballroom at the Sonesta Hotel in Cambridge MA was jam packed with fellow ‘Loti’ with reporters, teleprompters and live feeds from all over the world. After an elaborate fan fare unveiling people were standing and clapping. Steve walked off stage, came down into the front row and plopped himself on a table next to me. I froze. I showed him a pile of magazines and asked him to pick one to autograph for me. 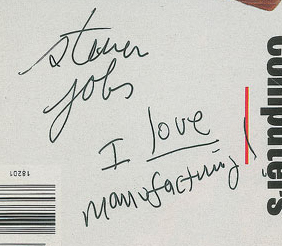 He hesitated and said ‘I don’t do autographs’ at which point I stepped closer, locked eyes and said ‘then write something from your heart.’ He smiled from ear to ear, picked the Newsweek and jotted the words: I love manufacturing and then signed it!” RR Auction sold this incredible magazine in October 2017 for an astonishing $50,587, smashing any previously held record for a Jobs autograph. 2. In August of 1989 at the Motorola Software Engineering Symposium in Schaumsburg, Illinois, where Jobs was a keynote speaker, a Motorola software employee was lucky enough to catch a quick meeting at the stage door. Jobs explained he had no pen or cards to sign, and the recipient subsequently provided his own pen and business card, which Jobs reluctantly autographed. This amazing sample, the first Jobs autograph we ever sold, achieved $5,676 at RR Auction in April 2012. 3. In January 1992, during the inaugural NeXTWORLD Expo at San Francisco’s Civic Auditorium and Brooks Hall, Jobs signed a vibrant event poster for a Canon USA employee demonstrating the NeXT computers. The elusive autograph target signed during a brief window just before the show opened. After resigning from Apple in 1985, Jobs moved on to work on the innovative NeXT venture, producing their first computer in 1988, aimed at business and higher education. Five years later, in 1997, Apple would go on to purchase NeXT for $429 million, 1.5 million shares of Apple stock, and have Jobs resume his employment at Apple as CEO. This incredibly vibrant poster yielded $19,600 at auction in March 2017. 4. In June 2001, in Cupertino, California, Jobs signed a 338-page Apple Mac OS X Administration Basics spiral-bound manual, which he inscribed, “All the best, Steve Jobs.” The original recipient recalled: “I met Steve Jobs, founder & then-CEO of Apple, Inc. in 2001 when I went to Cupertino, CA to get my technical training to become an Apple Technician. That day I had inadvertently parked my rental car beside his (a silver Mercedes Benz S500 with no license plate). It was afternoon, the end of my training day and I just got into my car when I saw Mr. Steve Jobs walking into his car. I rolled down my window and called up his name. He asked me whether he knew me. I told him I certainly knew who he was and immediately asked him if he would be kind enough to sign my Mac OS X Administration technical manual. He refused and said ‘I feel weird doing that.’ I refused to back down. After a bit of cajoling on my part, he finally told me to hand over the manual and pen. He said ‘give me those’ and he autographed my manual.” RR Auction sold the manual in March 2018 for an incredible $41,806. 5. In June 2008, Jobs coyly signed an issue of the Palo Alto Daily Post featuring an image of himself speaking at the Apple Worldwide Developers Conference for the introduction of the iPhone 3G. The clipping boasting the headline, “New, faster iPhone will sell for $199,” was additionally signed by then senior vice president of Apple’s iPod division Tony Fadell. The son of the original recipient recalled his mother obtaining the autograph at a frozen yogurt store of all places, “My mom noticed Steve Jobs sitting outside with a friend…picked up a newspaper…which had a photo of Steve on the cover talking about the release of the next iPhone, and she walked outside, asking Steve to sign the paper. Steve politely declined several times, stating that everything at Apple was a group effort, so he didn’t like to sign and take credit for everything. My mom…was eventually able to convince Steve to sign; but under Steve’s condition that the person sitting with him would have to sign it as well. That friend turned out to be Tony Fadell, known as the Father of the iPod, who was working at Apple during that time and instrumental in the design and development of the first iPod which later morphed into the iPhone.” RR Auction sold the newspaper clipping for an astronomical $26,950 in March 2018. When Jobs passed away on October 5, 2011, at the age of 56, his legacy as a creative genius burned bright, does to this day nearly seven years later, and as his admirers have shown, will only grow with time. The innovations he brought forth into the world revolutionized everything from music, to phones, to personal computers, and even animated movies. Job’s reluctance to sign autographs reveals a legend infamous for his stark independent spirit, having an unexpected deep appreciation for his colleagues. Believe it or not, the shining beacon of the technological world, shied away from being singled out as a star. Do you have more questions? Contact Tricia now!